I can’t believe I’m writing about Walt Disney World. Background: I love Walt Disney World. I love it so much that I like to formally call it “Walt Disney World” instead of “Disney World” when I’m talking about it in general. Let’s pay our full respects to Mr. Walter Elias Disney, shall we? My first trip to WDW (as I’ll likely refer to it from here on out, but please continue to read “Walt Disney World” if you don’t mind) was back in 1998. I was in middle school. You may think that I was ~too cool~ for a family trip at that stage in my life, but let me assure you, I’ve never been too cool for anything in my life ever. I knew right as I waltzed through those Mickey adorned trellises in my shockingly white keds (fake keds) that I was entering someplace special. Every single employee (or cast member, as they are referred) was 100% in. Nobody was mentally checked out. Nobody appeared bored. Every person working was happy, engaged, and smiling like I’d never seen people smile before in their life. As an awkward preteen at the precipice of the real world, I was thrilled to be at a place where reality seemed incredibly far away. I’ve never really lost that feeling. The first time Boone went to WDW, he was seven months old. The second time, he was two. The third time, he was also two. 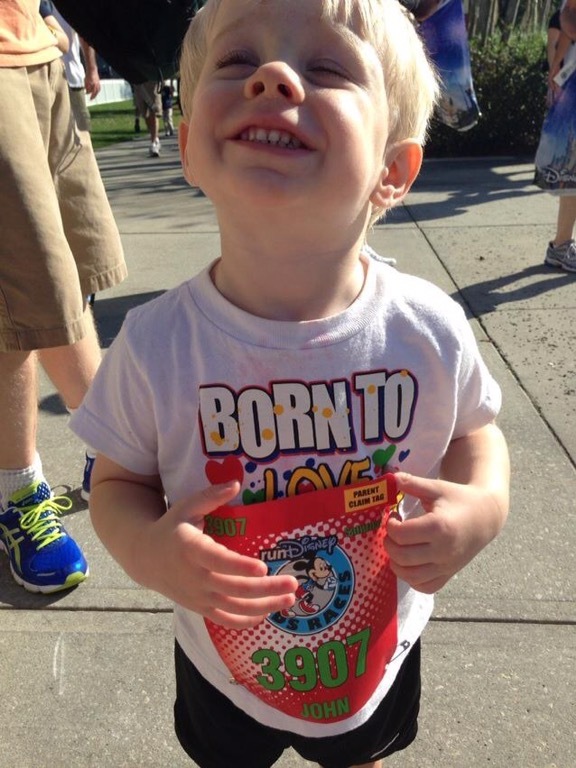 Boone’s first race was at WDW, of course. The fourth time, he’ll be five, and Jonah will be two. You could say I have a problem. But I don’t! I have a solution! A solution to the harsh realness of everyday life. You could also say I’m being melodramatic and I should probably visit a national park sometime. I DO THAT TOO, OK! Let’s just pretend this obsession is perfectly normal and makes perfect sense. And now to the crux of the post: So you’re thinking about going to Walt Disney World! I won’t try and convince you this is the vacation for you (it is). I will simply pass along my advice and you can choose to accept, ignore, or third party your way through this advice in the way of your choosing. I’m not an official WDW Travel Agent (though you’ll hear from one later in the series). I’m just a girl, standing in front of a mouse, asking him to recognize her love. Let’s dive in. WDW is alive in Spring, when flowers are blooming and trellises are shaped like Lightning McQueen. WDW is hauntingly perfect in Fall, when Mickey jack-o-lanterns adorn basically every open space. WDW is magical at Christmas, with trees and decor that would make even the smallest Grinch heart grow three sizes. WDW is crazy in the summer because the entire world is there and the air is so humid you can basically eat it but it is STILL wonderful because they do not skimp on the A/C. So… When can you go? You can have a fantastic vacation regardless of the time of year. If you can swing it, I would recommend trying to go during “non-peak” times. This may mean pulling your kids out of school (if they are in school) or staying home on Spring Break to save money for a vacation in September. Or February. Not only are lines shorter and shorter crowds smaller during the non-peak times, but it is during these times when Disney is prepared to offer its greatest discounts, one of the favorites being free dining. Yes, free dining means your meals are free. The amount of free meals you receive depends on where you’re staying (unless you choose to upgrade the plan you’re comped), but believe me, Disney food does not disappoint. Instead of raving about it here, I’m going to refer you to The Disney Food Blog, where you can get lost for a hours in a virtual wormhole of Dole Whips, Mickey pretzels, cupcakes, Mickey waffles, and any other snack your heart didn’t even know it wanted. And you’ll hear more about Disney food next week! 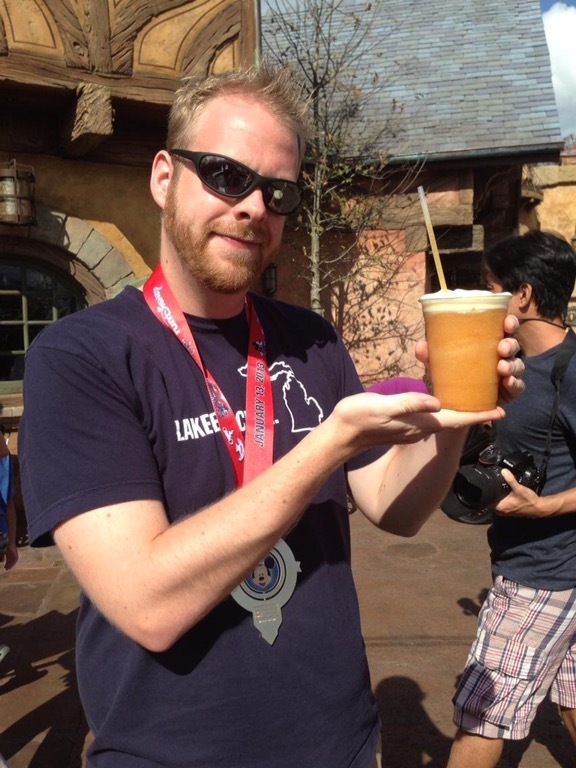 Jason enjoying a “LaFou’s Brew” in the Magic Kingdom. Seriously though, you should stay on property. There are various “levels” of resorts, from value to deluxe. The value resorts will still run you $100-$200 a night, depending on season. Moderate resorts are generally $150-$300, and Deluxe resorts generally start around $300 and climb from there. I don’t want to reinvent the wheel, and the good people at AllEars have a fantastic website for accommodations (and just about everything else, if you’re getting really deep into trip planning), so check them out if you want more detail (and lots of pictures!). For what it’s worth, Jason and I stayed at a moderate resort on our honeymoon (oh yes, we are those people… Come on, are you really surprised?) but every other time we have stayed at a value resort. The moderate and deluxe resorts are gorgeous and quiet, but when it comes down to it, we’re only using our room to collapse in at the end of the day. The value resorts serve that purpose well. Staying at a Disney resort has other benefits — all transportation is covered for your stay, including a complimentary bus ride to and from the Orlando airport. Those staying on property can also easily send souvenirs back to their rooms free of charge and enjoy extended park hours. HOW LONG SHOULD YOU STAY?! This comes down to what you can make work. I would recommend — at the least — a four day park hopper pass, if you want to see it all (in general). You have options when buying tickets — a “base ticket” allows you to visit one park (non-water park) per day. A “park hopper” allows you to visit multiple (non-water) parks in a day. One day ticket prices seem steep (and they aren’t cheap, I’m being honest), but the ticket prices become more reasonable the longer you stay. For an adult during “regular season” (March 11-31, May 27-31, June 1-30, July 1-23, November 20-27, and December 2-31) a one-day ticket costs $117.15, but for a four day pass, the cost is $346.13, making each “day” cost roughly $86. More info on ticket prices can be found at The Mouse for Less. So are you hooked yet? Mildly interested? Already a Disney fan looking for a fix wherever the Internet will give you one? Tune in next week for a more in depth look at the individual theme parks inside Walt Disney World and a brief glimpse at the joy and delight that is WDW FOOD! Thanks for indulging my fantasy to write about Walt Disney World. Have a magical day!